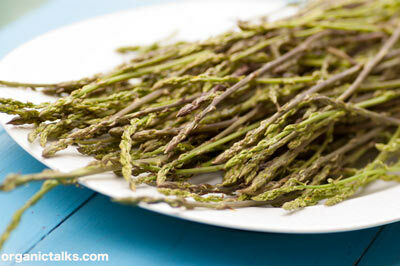 In springtime, in the Mediterranean area, picking wild asparagus is deeply embedded in the habits of people. Asparagus ‘hunting’ is a favorite pastime, because, in addition to providing several hours of outdoor activity in the pure forest air; the day ends with a delicious and nutritious meal. Picking asparagus in the wild is a great exercise after a long winter! And on top of that – it’s loaded with nutrients and antioxidants (more info below). We also love to go for a ‘spring hunt’ in the forest, and after that, we usually prepare this delicious wild asparagus dip/spread/sauce. It is made of avocado, asparagus and lots of dill. The sauce can be used for veggie rolls/pockets, or as a spread/sauce for bread and pizza. 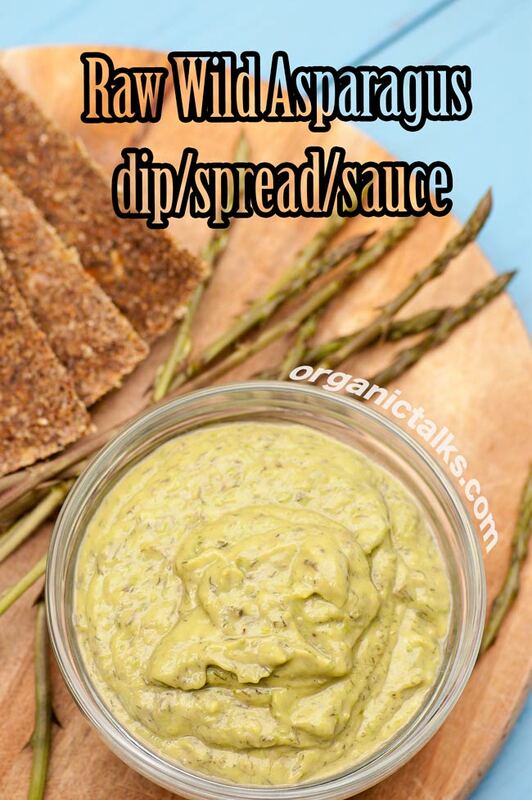 It is a perfect dip for celery stalks, carrots, or other vegetables. Also great for zucchini noodles! And if you are still mostly cooking, then is a raw wild asparagus sauce a healthier alternative to cooked sauces; use it for potatoes, lentils, and beans (a much healthier choice over processed food). Watch to let the cooked dishes cool down to 115ºF (46ºC) – so that you can hold it in your hand – before adding the raw asparagus sauce. Through that, the raw ingredients keep their taste, enzymes, vitamins and minerals. 1. Put all ingredients into a blender or food processor. 2. Process until well combined and creamy. Sounds delish. Can I add some olive oil in substitute of the water? I can’t tell you how much I love this dip – enjoy this gem! This is such an awesome dip! I can’t wait to serve at my next book club meeting with spicy, raw dehydrated flax seed crackers. The ladies will love it! Thank you so much for sharing this healthy and delicious recipe at the Plant-Based Potluck Party Blog Hop! I appreciate it!